Remember Ken Dodd? Tommy Cooper? Mick Miller? Jigsy does. Over the last thirty years he’s worked with them all – and he’ll tell you the stories to prove it. From the laughs down the pub to the horror stories of when it goes wrong on stage, Jigsy was there – permanent pint in hand. With sweat, smoke and failure clinging to his faded dinner jacket, he now works the dying Liverpool club circuit.This is Jigsy’s story: reliving the glamour and grit of his younger days, he now broods on the success he might have had. But despite it all he keeps on getting back up on stage.The audiences might be dwindling, but Jigsy always has a gag that sends them home laughing. 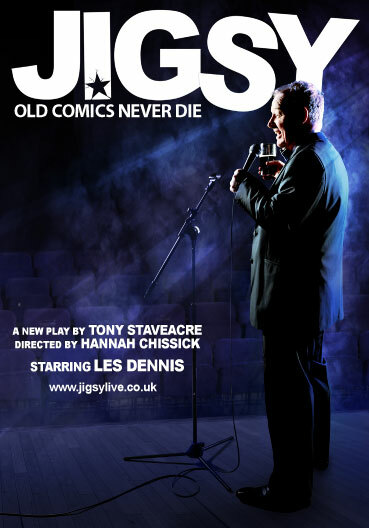 Tony Staveacre’s blisteringly funny new play stars Les Dennis.